WASHINGTON — As they become more prevalent, autonomous technologies will bear a bigger impact on freight transportation, according to panelists assembled at the U.S. Conference of Mayors’ winter meeting. Clement Bezold, chairman of the Institute for Alternative Futures, said autonomous technology in trucks eventually may play a role in the longhaul portion of journeys, meaning the part of the trip that takes place on interstates rather than inner-city streets. The Institute for Alternative Futures helps organizations monitor trends through forecasts and environmental scans. Bezold, who spoke on a panel on innovation Jan. 24, said the final few miles of a dispatch, which often involve weaving through cities and docking at warehouses, are the portions of a trip most difficult to navigate. Bezold said one possibility is a system in which a human drives a truck from a city to a more remote hub, at which point autonomous technology will move the freight for the longest part of the journey and then stop at a second station near the destination, where a human driver again will take over and deliver the goods. Some freight haulers have been apprehensive about autonomous vehicle technologies because they foster the perception that trucks soon may be driving themselves. Bezold cautioned about the role artificial intelligence can play in displacing jobs. He said 14-47% of nonfarming workforce jobs in the country will be lost by 2030. 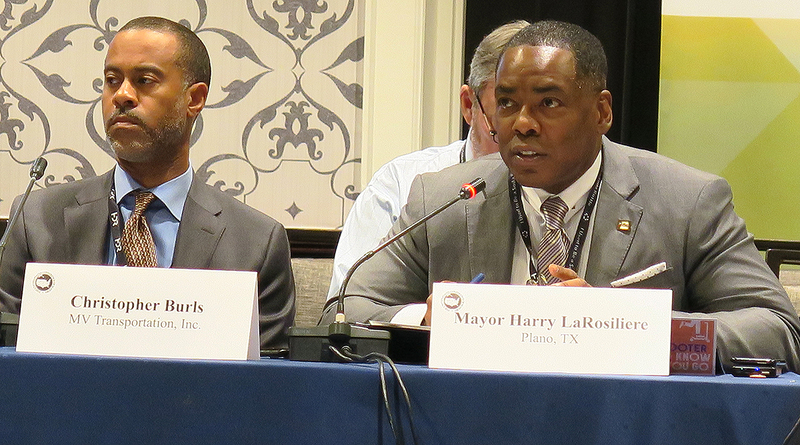 Plano, Texas, Mayor Harry LaRosiliere said autonomous technology undoubtedly will have a bearing on freight. He said private sector companies and government agencies must be proactive in retraining efforts in anticipation of workers who will be displaced. LaRosiliere led a separate discussion on transportation with a group of elected officials and industry representatives Jan. 24. Advancing a federal infrastructure package was another common theme among mayors who discussed transportation needs during the meeting. According to Bezold, the American Society of Civil Engineers estimates that the country needs to invest $2 trillion by 2025 to address critical deficiencies in infrastructure. LaRosiliere, who chairs USCM’s Transportation and Communications Committee, also listed renewing the Fixing America’s Surface Transportation Act and shoring up the Highway Trust Fund as goals. The Highway Trust Fund, which assists states with maintenance and construction projects, is expected to go bankrupt in 2020. LaRosiliere said debate about how to fund transportation projects often hamstrings discussion of infrastructure investment. He said a federal infrastructure package will only succeed once legislators decide on a means to fund investment, adding that he would like to see a deal move forward between now and May.